a) A chocolate-covered Macadamias every single day for the month of July? b) A packet of Potatochip for each day of January? c) A bar of Creamy Milk every single day in September? d) Chocolate wafers in October? e) Amande Chocôlat’ in Milk for November? Royce’ makes it possible this Christmas as it gives the biggest gift of all—a year’s supply of chocolates! Meticulously made in Sapporo (Japan) using only the highest quality ingredients, Royce’ is one of the top choices when it comes to chocolate, cookies, and sweets. 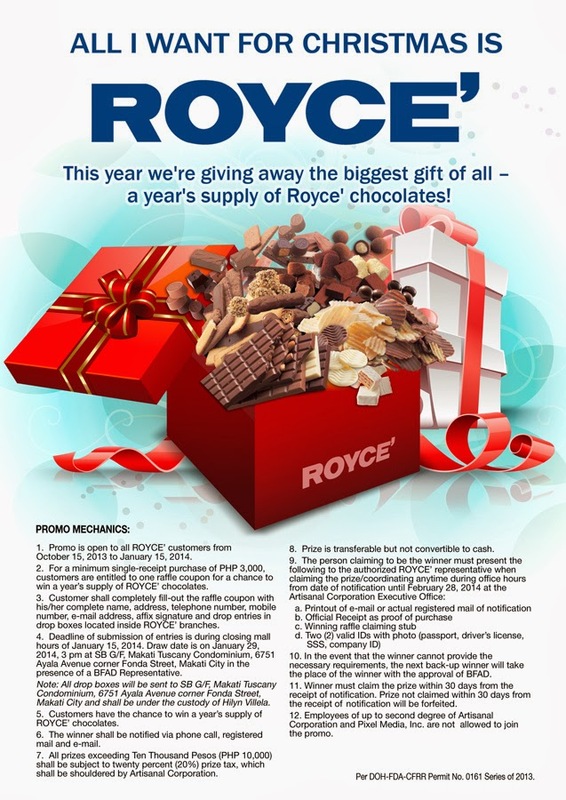 From now until January 15, 2014, Royce’ customers will get a chance to win a year’s supply of Royce’ chocolates, with one raffle coupon for every single-receipt minimum purchase worth Php 3,000. One lucky winner will take home more than enough chocolate to last for the whole of 2014. And with a different Royce’ chocolate variant every month, this is a chocoholic’s dream come true. I love chocolate! Can't imagine myself eating different chocolates every month. 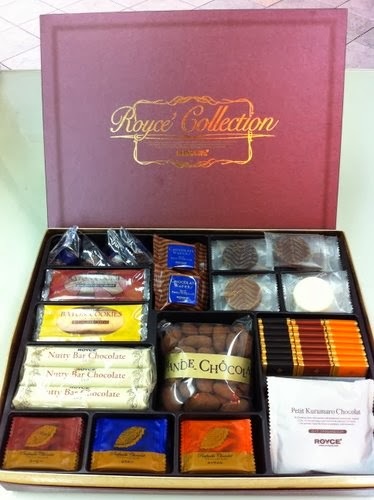 I love Royce chocolate as the sweetness level is not too overpowering and comes in various flavors. I haven't tried Royce chocolates yet, I knooooow :( I guess the universe is already telling me to try it with this giveaway, LOL! Seriously, this one is really a great deal since Royce is really pricey and winning a year supply is just wow! Loved the chocolates and the promo itself. Nice to have the prize instead?